There are ways to organically control most insects and fungi that attack apple trees without using commercial insecticides that are environmentally unfriendly. Apple scab and powdery mildew are the most pernicious problems because they can cause the total loss of leaves and dramatically reduce the apple crop. Horticulturalists at Michigan State University recommend spraying apple trees with copper sulphate, lime sulfur or sulfur as soon as you see the green in the apple buds in the spring. If the green tissue is 1/2 inch long or less, spray 48 hours before it rains. Spray until the leaves drip. Do not apply copper when the tip is 1/2 inch long or your apples will suffer russeting, a brown network on the skin. Apply sulfur three to five days before it rains when the buds show a 1/2-inch green tip until four weeks after the petals fall. If the leaves on your tree are infected with scab four weeks after the petals fall, continue sulfur sprays every two weeks until you harvest the apples or until the end of August. Apply 1 tbsp. of dry copper sulfate to a gallon of water, 1 3/5 oz. to 10 gallons of water, and 1 lb. for each 100 gallons. Apply 2/3 oz. of liquid lime sulfur to one gallon water, 6 2/5 oz. to 10 gallons of water, and 1/2 gallon to 100 gallons of water. Apply 3 2/5 oz. of sprayable sulfur to one gallon of water, 1 1/5 lb. to 10 gallons of water, and 5 lbs. to 100 gallons of water. To control aphids and mites, spray with dormant oil when the plants are dormant up until the green tips on the buds are 1/2 inch long. Dormant oil suffocates insects. Do not spray unless the temperatures remain above freezing for at least one day. If the blossoms are pink up until the petals fall, spray with a commercially available biological soap that kills aphids with potassium salts made from naturally derived fatty acids. Dormant oils are incompatible with sulfur. Do not use sulfur sooner than seven to 10 days after applying dormant oil. Earlier use can damage your leaves and apples. Spray tentiform leaf miner with a natural insecticide made from the seeds of sabadilla, veratrum sabadilla, or from the flowers of pyrethrum, a species of chrysanthemum. The coddling moth feeds on apples. Spray with Bacillus thuringiensis, a soil-borne bacterium that functions as a pesticide. It is also found in the guts of caterpillars, butterflies and moths. Spray twice, once in June, and once in August through September 15. 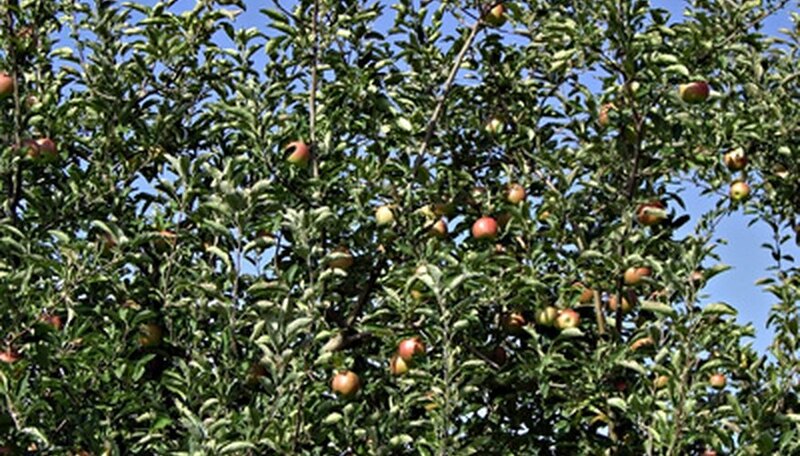 Leaf rollers can destroy apples in August and September. Spray with Bacillus thuringiensis from when the blossoms are pink to June 30, and again between July 15 to September 15. Spray with pyrethrum or rotenone from July 1 through September 15. Rotenone is an insecticide that is found naturally in several plants, including the jicama. There are no organic treatments for plum curculio, an insect that burrows into apples, or for sooty blotch and fly speck. To keep damage from plum curculio to a minimum, immediately pick up all apples that drop in June. Sooty blotch and fly speck affect the appearance of the apples. Careful sanitation of pruning tools used to remove infected branches can do much to control black rot and fire blight.